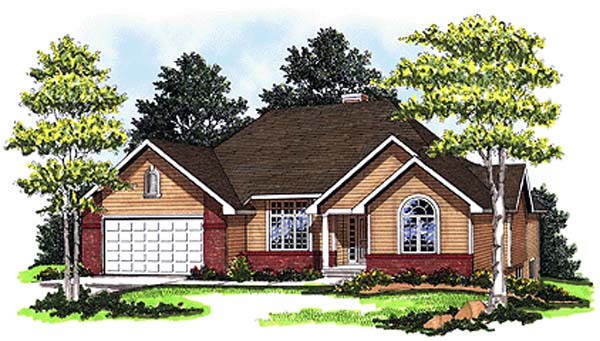 A hip roof, stacked gables, and large windows offer an attractive face to the neighborhood and house an equally attractive floor plan. To the left of the foyer, well-proportioned public rooms offer comfortable spaces for entertaining and everyday living. The spacious great-room is separated from the dining room by a shared fireplace. The large kitchen, with ample counter space and a convenient center island, leads into a laundry/mudroom with a large closet conveniently located next to the door to the two-car garage. A long hall to the right of the foyer buffers the bedrooms from the public area. The master suite has access to a rear patio. 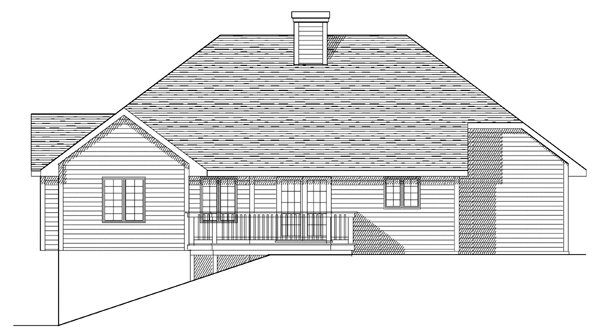 Optional spaces in the basement can be finished to include a third bedroom, a full bath, and a recreation room while still leaving plenty of space for storage. This home is designed with a basement foundation.